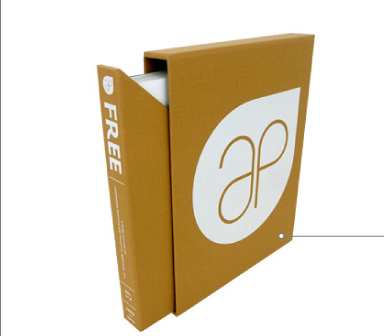 Create a professional complete look by storing your binders, portfolios or books in a matching slipcase or slashbox. Take advantage of our high-speed Emmeci slipcase machine which is ten times faster and more accurate than our competitors. Customize your project to your specifications. Choose from hundreds of specialty wrap materials, accessories and custom die cuts. Decorate it with foil stamping, die cutting, screen printing, spot UV coating, debossing or full color printing. This matching slipcase and slashbox was wrapped in Arrestox B-Butterscotch and screen printed to achieve a clean modern look. We manufactured this full color, turned-edge slipcase along with 6 fully concealed plastic coil books, fulfilled and shipped in a week! Together with our sister company, Bindagraphics, we can produce your next book and slipcase/slashbox project all under one roof! Call us today for more information.